Joint Real Estate Investment: A Limited Time Offer (LTO) effective from May 1, 2018 to October 31, 2018 allowed two applicants to jointly purchase qualifying real estate, each applicant investing a minimum of US$200,000 (instead of the US$400,000 per applicant previously required). Dependents Age Reduction: The age of parental dependents has been reduced from 65 to 58 years old. Also, the requirement for dependent children under 18 years of age to visit the nation for a minimum of 5 days in the first 5 years has been removed. Removal of Due Diligence Fee: The due diligence fee of US$5,000 during the first five-year passport renewal stage has been removed. Late last year, the government also officially reduced the National Development Fund (NDF) contribution from US$200,000 to US$100,000, effective from November 2017. Renowned as a luxury holiday and wedding destination, Antigua and Barbuda has 365 beaches – one for every day of the year. With gorgeous views, landscape and good property values, it is an ideal location for a second home, attracting celebrities like Oprah Winfrey, Giorgio Armani, Richard Branson and Eric Clapton. It is now being promoted also for family-oriented vacations. The opening of a US$45 million Airport Terminal at the VC Bird International Airport in 2015, and the completion of the US$15.9 million Barbuda Codrington Airport in 2017, helps make Antigua and Barbuda super-attractive both for tourism and business. An amazing number of construction projects are underway - amazing, given that the islands' population is only 92,000. For instance, the US$1 billion Singulari development, Antigua and Barbuda's first mega-resort, is expected to create 1,000 jobs. This 1,600-acre multi-hotel, residential and commercial project is being lauded as a major feather in the country's tourism cap. Singulari spans 900 acres of land in the north of Antigua and 700 acres of tiny islands. It includes several luxury hotels, hundreds of private homes, a school, hospital, marinas, golf courses, an entertainment district, horse racing track and the Caribbean's biggest casino. The&nbsp;Bau Panel&nbsp;is building around 5,000 homes across Antigua and Barbuda at a cost around US$200 million. A brand new&nbsp;Sandals Beaches Resort&nbsp;will be built on the Grand Pineapple Resort. Sandals Resorts International (SRI) is expected to build a new 250-room hotel in Dickenson Bay, next to the Sandals Grande, and will begin building&nbsp;Beaches Resort&nbsp;this year. A new residential complex with over 200 condominium units costing US$400 million is expected to open this year. Sunwing Travel Group is developing a 500-room resort under the&nbsp;Royalton Luxury Resorts&nbsp;brand at Deep Bay, Antigua. Replay Resorts intends to build a five-star hotel, along with oceanfront and hillside villas, cottages and estate lots at Half-Moon Bay. A new hotel resort at Long Bay is being built. There is also continued development of resort and residential tourism projects at&nbsp;Pearns Point Harbour Island Hodges Bay Club Morris Bay, and&nbsp;Tamarind Heights. Massive reconstruction activity is also ongoing in the island of Barbuda after Hurricane Irma hit it in September 2017, leaving about 90% of its housing stock destroyed. There are no official house price records in Antigua and Barbuda, and reliable information is hard to come by. But based on recent research by the&nbsp;Global Property Guide, not a lot has changed recently. Two-bedroom houses still average around US$350,000 while three-bedroom and up houses might cost about US$600,000. During the boom years, house prices in Jumby Bay increased 60% to 100%, according to the Global Property Guide. However, the market was hit by the global financial crisis in 2008, halting construction of several residential developments. Tourists stayed away – and since the nation's economy is largely driven by tourism, real GDP went down and construction and foreign direct investment declined. The twin nation's economic growth slowed to 2.8% in 2017, after GDP growing 5.3% in 2016, 4.1% in 2015, and 5.1% in 2014, according to the&nbsp;International Monetary Fund&nbsp;(IMF). The economy is expected to expand by 3.5% this year and by another 3% in 2019. Not a lot has changed in the housing market of Antigua and Barbuda over the past year, though there has been a cooling since the overheating of 2008, when Antigua and Barbuda seemed to be the new ‘in’ place. 2-bedroom houses still average around US$350,000. 3 bedroom and up might cost US$600,000. Gross rental yields are low, averaging around 4%. Rental Income: Net rental income is taxed at a flat rate of 20%, withheld by the tenant. Income-generating expenses and depreciation expenses are deductible from the gross rent to arrive at the taxable income. Capital Gains: There are no capital gains taxes in Antigua and Barbuda. Inheritance: There are no taxes on inheritance in the islands. Residents: Residents are taxed on their worldwide income at progressive rates, from 8% to 25%. Roundtrip transaction costs are around 21% to 24% of the property value, inclusive of the agent’s commission (5% to 7%). The biggest chunk of the cost goes to stamp duty at 10% (7.5% paid by the seller and 2.5% paid by the buyer). The buyer also pays for the Alien Land Holding License (ALHL), which is 5% of the property value). Short-term leases, a week’s time or so, are the most common tenancy agreements in Antigua and Barbuda. Antigua and Barbuda’s economy largely depends on tourism which in turn is determined by economic trends and social trends of foreign markets. Weather conditions also directly affect the tourism industry and the country is very vulnerable to hurricanes. Tourism accounts for about 60% of GDP and 40% of investment in Antigua and Barbuda. In 2017, visitor arrivals surged almost 18% to 1,035,692 people, according to the Antigua Statistics Office, in sharp contrast to the 3% decline recorded in a year earlier. Then during the first half of 2018, total arrivals rose further by 14.4% y-o-y to 665,268 people, and visitor expenditure increased by more than 28% compared to the same period last year. “We are doubling our airlift out of Miami, introducing new direct service out of New York and Canada, and welcoming new cruise ships to an already busy schedule,” said Colin James, the CEO of the Antigua & Barbuda Tourism Authority (ABTA). 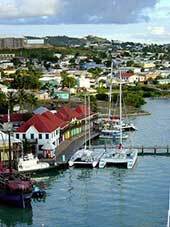 Antigua and Barbuda’s economic growth slowed to 2.8% in 2017, after GDP growing 5.3% in 2016, 4.1% in 2015, and 5.1% in 2014, according to the International Monetary Fund (IMF). The islands achieved super-rapid growth from 2003 to 2007, when GDP grew an average of 8% a year and reached over 12% in 2006, due to a tourism and construction boom as the nation prepared to host the Cricket World Cup. However, during the financial crisis the economy contracted by 12.1% in 2009, by 7.2% in 2010, and by another 2.1% in 2011. The country’s gross debt briefly ballooned to 102.1% of GDP in 2014, up from 86.7% in 2012, but declined to 86.8% of GDP in 2017. For decades Antigua and Barbuda's politics were dominated by the Bird family. Vere Bird led the country into independence in 1981. He remained in office till 1994, when he was succeeded by his son, Lester, who then spent a decade in office. But behind this stability was a succession of scandals and allegations of corruption. The opposition United Progressive Party led by Baldwin Spencer won a landslide victory in general elections in March 2004. A lifelong labour activist, Baldwin Spencer was born in the working-class community of Green Bay, and he promised that "crimes committed against the people" would not go unpunished. But to date the government has been clearly pro-business. Spencer was succeeded by Gaston Browne, who took office on June 12, 2014. Right after taking office, Prime Minister Gaston Browne vowed to address the shortage of affordable housing in Antigua and Barbuda. The National Housing Development and Urban Renewal Company Ltd ("National Housing") was established in 2014 to provide good quality and affordable housing to all. Browne promised to build 500 subsidized homes in a span of just 500 days to be sold at two-thirds of their market value, with an average market value of US$300,000. However, three years later, only 48 such houses have been completed. Amidst criticisms, the government has recently vowed to fast track the construction of houses. Accordingly, 160 homes in Paynters site will be completed by end-2018, 148 homes in Denfields, and 60 homes in Lightfoot. “As matters stand, we have over three hundred homes under construction and we remain determined, to provide several thousand homes in the coming years; in keeping with our commitment to expand and renew the housing stock,” said PM Browne. The housing projects include two, three and four bedroom houses. Two-bedroom houses will cost about US$193,500 while three-bedroom houses will cost US$195,500, according to Bernard Gardner, the managing director of National Housing. Three-bedroom houses have an estimated value of US$244,000. Gaston Browne was recently sworn in as Prime Minister of Antigua and Barbuda for the second time, following his landslide victory during the March 2018 general election.